Writing a personal thank you letter may seem like a piece of cake, but it can be a lot harder than you think. To express our sincerity and gratitude in a meaningful way, we need the right words. Finding them can be frustrating and we often shelve the project in the process, but with a few simple rules in our pocket and some prompts to get started this process is much easier and more enjoyable. Next, your salutation followed by a comma such as “Dear Loren,” If you know the person well it is acceptable to use “Hi”. Close your letter with “Regards” or “Kind Regards”, if the receiver is a close family member or friend you may close with “Love”. Attach a business card to have for future reference. From the basic tips and prompts above it is quite clear that writing a personal thank you letter is not as difficult and frustrating as you would have previously thought. It conveys your appreciation in a meaningful way renews mutual respect and strengthens ties. 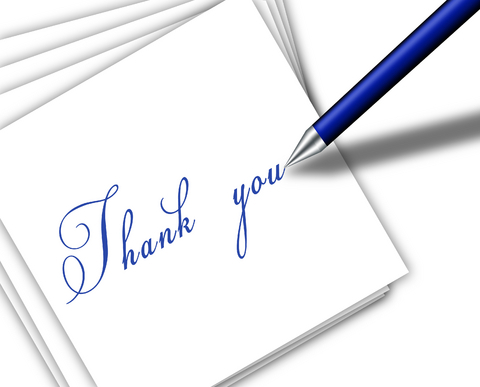 Writing a post interview thank you letter.